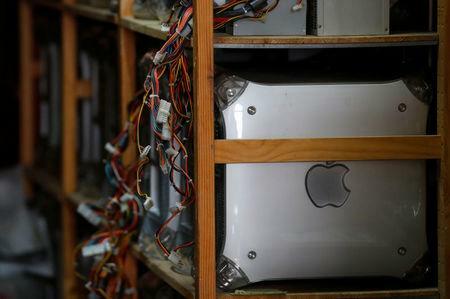 VIENNA (Reuters) - An Austrian computer repairman has amassed what he believes could be the world's biggest collection of old Apple computers, but it might all soon be destroyed unless someone can take it off his hands. Over the years since he began working for a company that repaired Apples in Vienna in the 1980s, Roland Borsky's collection has grown to roughly 1,100 computers, he says - far more than the 472 items at Prague's Apple Museum, which says it is the world's biggest private collection of Apple products. "Just as others collect cars and live in a little box to afford them, so it is with me," he said in his office, which is so packed with dusty items like a wall of old monitors that he has moved most of them to a warehouse outside the city. Ironically, however, Apple's success has made life harder for his business, and he has decided to close it. Apple opened its first store in Vienna in February, taking over much of the repairs previously done by firms like Borsky's. Parts are also often harder to replace on Apple's newer devices, he says. Asked what would happen to his collection if that didn't happen soon, he said: "It'll be shredded. That is what bothers me the most because I can't currently rent a storage space that I can afford." "I would be pleased if it is simply put on display anywhere ... so people can see it," Borsky, 53, said.